Seriously, look at the size of these sunflowers! Just fields of sunflowers as far as the eye can see! No trip to Florence (or Italy for that matter) is complete without a road trip through the gorgeous and rightfully-famous countryside of Tuscany. This is especially true during sunflower season (don’t worry I will be sharing more pictures of these amazing sunflower fields next week). After my incredible experience in the sunflower fields last summer, I knew I wanted to return this year. 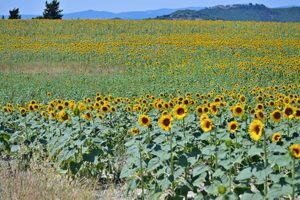 So I decided to kill two birds with one stone and overcome my fear of driving in Italy by renting a car for the day to explore the sunflower-filled countryside. My friend Jackie, who works with me at the archive, was brave enough to join me as chief navigator. I spent about a day researching the best routes and stops. The weather has been ridiculously hot this summer, so I wanted to keep the trip manageable. Based on location and proximity to sunflower fields and provincial roads (getting off the main highway is half the fun), I picked four towns I wanted to explore — San Galgano, Montalcino, San Quirico, and Pienza. If you are traveling to Florence for the first time or have never explored the countryside, I highly recommend expanding this road trip to include San Gimignano, Siena, and Montepulciano with an overnight stop in one of the regions amazing agriturismi (they are like farm house B&Bs). The route would remain the same — south on the SS73, east on the E78 and SR2, and then north on the A1 — with an overnight stop half way through. Fortunately, while driving in Italian cities can be chaotic and overwhelming, driving through the Tuscan countryside is easy and relaxing (Tip: you can avoid the chaos of Florence by picking up and dropping off your rental car at the airport). We started our journey heading south out of Florence towards the abandon ruins of the Medieval abbey of San Galgano. Just before turning down the final road to the abbey we stumbled upon the most amazing field of sunflowers (of course it turned out to be one of many). We immediately pulled over and started frolicking and taking pictures in the fields (of course we asked the proprietors first, who were happy to let us). After visiting the roof-less abbey (it was abandon in the middle ages thanks to drought and plague), we headed east to hill towns of Montalcino, San Quirico, and Pienza. Each little town offers gorgeous views and amazing food and wine. I also suggest making time for a impromptu wine tasting at any of the wineries along the way. We ended our journey with the incredible Val d’Orcia, which is so gorgeous and famous (tons of movies have been shot there) that it is a UNESCO World Heritage sight. 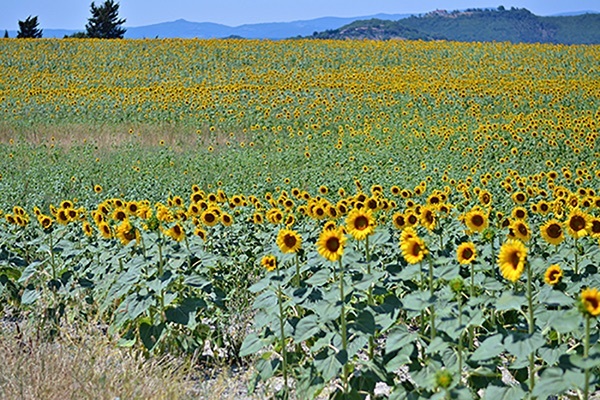 Images of this countryside have become emblematic of Tuscany. It ended up being a long and exhausting day, but completely worth it! Have you road tripped through Tuscany?